Get to know the famous and not so famous faces of the cult show. Neil Gaiman’s incomparable novel American Gods tells the story of Shadow Moon, a small-time thief newly released from prison and recast as a grieving husband who soon finds himself in the employ of the irascible Mr Wednesday. 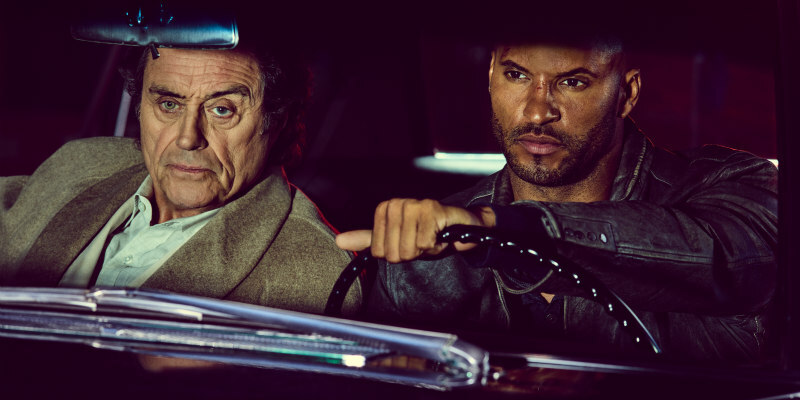 Beloved by fan and critic alike, the novel has now found its way to the screen in the breathtaking form of Bryan Fuller’s American Gods, available on digital platforms from July 24th, and on Steelbook, Blu-ray and DVD from July 31st. Proving that creative energy, invention and a passion for pushing the realms of episodic TV can conquer anything, Fuller’s absorbing, outlandish and wildly entertaining vision has proved to be more than a match for Gaiman (who, along with screenwriter James Green, has had a hand in the show’s journey to screens). The results are quite simply astonishing, essential television. But with a peerless ensemble cast of famous faces, newcomers would be forgiven for being diverted by a round of ‘where do I know that face from?’. Step forward us to save you a job - here’s an introduction to the familiar faces in the box set of the year! Shadow Moon is released from prison to a life turned upside down - no wife, no job, and no bearings. He is offered a job by Mr. Wednesday as a bodyguard, and as they journey across America, Shadow finds himself questioning a world where gods exist and magic is real. Where you’ve seen him before: 35-year old Ricky Whittle started his professional life as a model for Reebok back in 2000 before catching his big break as Calvin Valentine on Channel 4 soap opera Hollyoaks (where he first became accustomed to and extremely comfortable with taking his top off at the drop of a hat). Five years in the suburbs of Chester was plenty for Whittle, though, and he left the UK to find his fame and fortune in the States. Roles in NCIS and Mistresses soon saw US casting directors take notice, leading to a recurring role on sci-fi series The 100, and the rest, as they say, is history. Where you’ve seen him before: Ian McShane has been acting since the 1960s, with early appearances including Z Cars and an adaptation of Wuthering Heights (where he played Heathcliff, naturally). Gradually wending his way into the national consciousness through seminal appearances in Roots and Jesus of Nazareth, McShane cemented his status as a national treasure with the lead role in the much-loved Sunday night drama Lovejoy, a gig that also saw doors open in America, with attention grabbing performances soon following in the epic War & Remembrance and even Dallas. Deadwood, the critically adored Western series, saw McShane enjoy something of a renaissance, with blockbusters such as Pirates Of The Caribbean: On Stranger Tides and Snow White and The Huntsman bolstering an already enviable profile. He teamed with Ryan Murphy (alongside Bryan Fuller, TV’s other great wunderkind) for American Horror Story and impressed further in Ray Donovan, John Wick and Game Of Thrones before landing arguably his most perfect role to date as the enigmatic Wednesday. Laura Moon is Shadow Moon’s ethereal wife. She dies unexpectedly just before Shadow’s release from prison. Little does she know that her untimely death will lead her to an epiphany about her relationship and afford her a second chance to make amends. Where you’ve seen her before: Hailing from Australia, Browning first stood out to an international audience in the Billy Connolly vehicle The Man Who Sued God, before going even more mainstream in b-movie treat Ghost Ship. Fortunately, quality prevailed before long and Browning took the role of Violet in the acclaimed Lemony Snicket: A Series Of Unfortunate Events. Blood and guts have never been far away in her career, though, with The Uninvited and mega-flop Sucker Punch both ultimately standing her in good stead for the magical world of American Gods, but a breathtaking performance in Krays drama Legend made the world take notice - and Laura Moon is set to see her repeat that trick in spades. The living embodiment of mass media and entertainment, Media has been around for a long time, although not as long as the Old Gods. She began to thrive when entertainment began to cause mass effects as far back as the 1930s with Orson Welles’ panic-inducing broadcast of War of the Worlds. Where you’ve seen her before: Anderson needs little introduction thanks to her defining role as Dana Scully in Chris Carter’s massively influential The X-Files. The series kicked off in 1993 and has so far garnered two big screen outings and a further limited series (with more to come). But Anderson’s career post-X-Files has been even more interesting, with Bleak House, The Last King Of Scotland and the simply brilliant The Fall marking her out as perhaps the actress of her generation. Anderson also teamed up with Bryan Fuller to complete a staggering turn as Doctor Du Maurier on Hannibal, an experience that clearly set a fantastic partnership in motion if her performance as Media in American Gods is anything to go by. Mad Sweeney, a down-on-his-luck leprechaun, is having a hard time understanding how he lost his charm and way. Always up for a good fight, Sweeney is never deprived while in the employment of Mr. Wednesday. Where you’ve seen him before: You’d be forgiven for thinking Orange Is the New Black was Pablo (brother of Liev) Schreiber’s big break but the truth is this 6'5" tall star has quite the career. Peaking early with The Wire, he went on to ratchet up further appearances in Vicky Cristina Barcelona, Numb3rs and It’s Always Sunny In Philadelphia before hitting pay dirt again in Weeds, The Brink and Law & Order: Special Victims Unit. Netflix’s prison drama gave Schreiber his first real chance to grand stand, though, with George ‘Pornstache’ Mendez marking him out as one to watch - and leading directly to a barnstorming, electric performance as Mad Sweeney, the down-on-his-luck leprechaun so determined to recover his lucky coin at any cost. The leader of the New Gods, Mr World represents globalisation and all that entails. Unhinged and unpredictable, his power relies on global acceptance of the importance of the whole. Where you’ve seen him before: Crispin Glover is the rarest kind of screen presence. An early appearance in Friday The 13th: The Final Chapter prepared no-one for the series of leftfield choices he would go on to make. Most UK audiences would recognise him as Marty McFly’s dad from Back to the Future, and a few might also call him out as The Thin Man from Charlie’s Angels, but it’s undoubtedly his indefinable presence in more out-there films such as Willard, What’s Eating Gilbert Grape and Even Cow Girls Get The Blues that has resulted in his fans being closer to acolytes than anything else. Zorya Vechernyaya is one of the Old Gods, and comes from Slavic mythology. She represents the Evening Star, Mercury, and has two sisters, Zorya Utrennyaya (the Morning Star) and Zorya Polunochnaya (the Midnight Star). Where you've seen her before: Cloris Leachman is the American national treasure you love, even if you don’t realise it. A jobbing TV actress in the late '40s and '50s, she cropped up in Lassie, Rawhide and The Virginian before really hitting her stride in the late '70s, following an appearance in Butch Cassidy and the Sundance Kid. Appearing as Phyllis in Mary Tyler Moore and her very own spin-off, Phyllis, Leachman became a fully-fledged TV icon thanks to her roles in The Facts of Life, The Nutt House and even the much-loved Ellen. Her career took something of a post-modern turn in the '90s thanks to turns on Beavis and Butthead, and even if you don’t know her face, you’ve heard her voice on anything from The Croods through to Phineas and Ferb. The embodiment of a ‘black god’ from 12th century Slavic folklore, Czernobog is one half of the bad and the good, his opposite number affecting a positive balance to his dark outlook. Where you’ve seen him before: Peter Stormare is easily one of the most terrifying actors of his generation. Swedish in origin, he’s taken an imposing frame and face and turned it into an industry, appearing (usually as a bad’un) in projects as diverse as The Big Lebowski, Minority Report and Constantine (delivering a uniquely terrifying take on Satan). No stranger to TV projects also, Stormare has appeared in Prison Break, Entourage and The Blacklist before taking his bow as the brutish Czernobog in American Gods. Bilquis, an ancient goddess of love who craves the worship she inspired in eras long ago, is eager to find that same relevance in today’s world. Technical Boy, a New God, is purveyor of all things technology. Desperate to prove himself, and hungry for respect and power, he struggles to keep his impulsivity and petulance in check, making him dangerously unpredictable. Where you’ve seen him before: Another newcomer, Bruce Langley takes on the role of Technical Boy with an assured touch that suggests, just like his character, that the future might just be all about him.